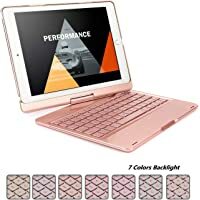 Get Naswei Keyboard Case for iPad Pro 10.5" with 360 Rotation Slim Smart Hard Shell Aluminum Alloy Case (several colors) for only $37.29. Tip: Avoid low or no feedback sellers, search and select "Buy It Now" tab and sort by lowest price. You may modify min price to filter accessories to get Naswei Keyboard auctions.